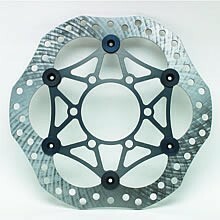 PVM Racing has about the best example of these rotors available for street bikes. If you do not NEED wave rotors, do not get them. A round rotor with a simple "porsche" drilling will work much better for far longer. Many riders never use the rear brake. If you are one of these riders, you should try to get the lightest rotor possible in the rear. TCM Motorcycle Products has a service for drilling out stock rear rotors to make them light. At $75 this is a major reduction in unsprung weight for very little money.